This topic contains 496 replies, has 49 voices, and was last updated by Bitul 2 days, 1 hour ago. The noitzrim believe their guy died but is moshiach. So does chabad. The noitzrim believe their guy is one with God, beyond what any other Jew is. So does chabad. The noitzrim believe you can daven to their guy instead of Hashem. So does Chabad. The noitzrim should sue for plagiarism. Please don’t tell me nobody davens to the Rebbe if the sicha from 1979 EXPLICITLY PERMITS IT AND SAYS THE 5TH IKKAR DOESN’T APPLY TO THE REBBE DUE TO ATZMUS. So either they hold it’s true or they hold the Rebbe said apikorsus there and forget about it, but then moshiach can’t be an apikoires. Let’s say you have the most charitable reading of the 1979 sicha and somehow wriggle out of the fact he said “atzmus means no violation of the 5th ikkar” which itself violates other ikkarim as well as the 5th. The Rebbe wasn’t an apikoires and he meant well . YET, it’s an established fact that there are chabadnikim who do daven to the Rebbe (based on that sicha), call him “our Creator”, some say “Rebbe YHVH”, etc. So How can moshiach be someone who caused people to turn away from Hashem and worship avoda zara? Listen to the Rambam’s ikkarim and the heintigge gedoilim- stay away from Chabad. Ein od milvado. Hashem helps, no other power helps. so speak to a lubavitcher thats a talmid chacham. Btw, the chabadsker knew how to learn. Again, ad the gedoilim are correct, you DON’T speak to Lubavitcher talmidei chachomim because they are michutz lamachaneh. This attitude of “ignore your gedolim and speak to ours” is kind of weird, especially since they are the ones veering off the 13 ikkarim not us. It’s up to them to recant the apikorsus and rejoin klal yisroel, not up to us to ignore our gedoilim and understand their apikorsus. Atzmus sicha said you are allowed to daven to the Rebbe because he’s Hashem in a human body. So mima nafshach- either you agree with him and you’re an apikoires, or you argue on him which means you hold your rebbe was an apikoires, and what’s to defend? Rso (regarding sukka) I got the point you’re not interested. אין הדבר תלוי אלא ברצונו. Have you seen the (handwritten) letter of the Rebbe (ZATZAL) stating that it is irrelevant what the name of Mashiach is? (And others similar?). And those times he refused to go out to the Lag Baomer parade because the “flaggers” of the day were there? I never said it’s relevant, nor did I say he is moshiach, and it’s not noigeih who he is. Could someone please post me a source for the atzmus sicha? Like Ysiegel that only one who represents Lubavitche is the Rebbe himself, you have questions go like a mature person, and check it up and learn the einyunim, all the sichos have marekomois. If you still have questions, go too well respected Lubavitchers like the Rebbe choizer Reb Yoel Kahn, and alike. The people that the Rebbe himself put in charge of the moisdois. Not every Joe schmo can have an opinion. For all these comments it looks like you guys just get your info online propaganda, and believe it’s true. Be a normal person and look up the enyonim. I’m sorry you still feel that way, but I’m sure you can get some help in understanding, same as all the litviseh and chassidish, that came Lubavitche got there answers. If your problem is that it bothers you that someone can be more machmir then you then you, I have no problem saying that I’m more meikil. I can definitely say that no sleeping in the sukkka, is not being more machmir then the ones that are, but I can’t say (according to my knowledge of the sicha) not were being more meikil, is just a minhag that we don’t, (and the minhag is not being mevatel mitzvos teishvu) but if you consider it bieng meikil, then I got no problem with it. My only problem is that how you can have a whole conversation with teinois on us, when you never learned the sicha. It’s news to me. It’s totally wrong, and not allowed, to me they are not considered Lubavitche, because the Rebbe would never let that happen. Next time I’m there I will go check it out. Iyh. I just got a chance to look at the CR. Have you let everything out yet, or you still need more time? Let me know when you flush. Everybody on this thread please read the quote above of Anyusername before going futher, because I have had more than enough of this distortion, warping, and סילוף of divrei Torah and I would like to eradicate it once and for all. The section in question starts on volume 5 page 2984 and goes for almost page. NOWHERE, NOWHERE, NOWHERE (yes, I am shouting) does it say that “STUDENTS ARE SUPPOSED” to believe that their rebbes are Moshiach! And to assume that the talmidei Ari z”l said that he was the Moshiach of his time because he was their rebbe is outright chutzpah! Do you really believe that Reb Chaim Vital and his colleagues zecher tzaddikim livrocho were so petty that they “rooted” for their rebbe because they happened to be his talmidim. If they claimed he was the moshiach of his day it was because they knew that he had ALL the necessary qualifications. Not fictional descent from Dovid Hamelech, not inane statements like “He was the nossi”, not ridiculous gematriyos like Beis Moshiach = 770. You are turning the talmidei Ari z”l into a group of baseball fans R”L! So I suggest that you either put up or shut up. Either show me sources that say what you claim they say, or slink off into the sunset. Enough of the apikorsishe warping of holy sources in order to justify your ludicrous beliefs. Any username- Rso has your number. You keep trying to bring “proofs” oiszehen bei di misnagdim, and Rso keeps actually researching your proofs and debunking them (e.g. David Lichtenstein, the Rashi and Maharsho in Sanhedrin, the Sdei Chemed….). 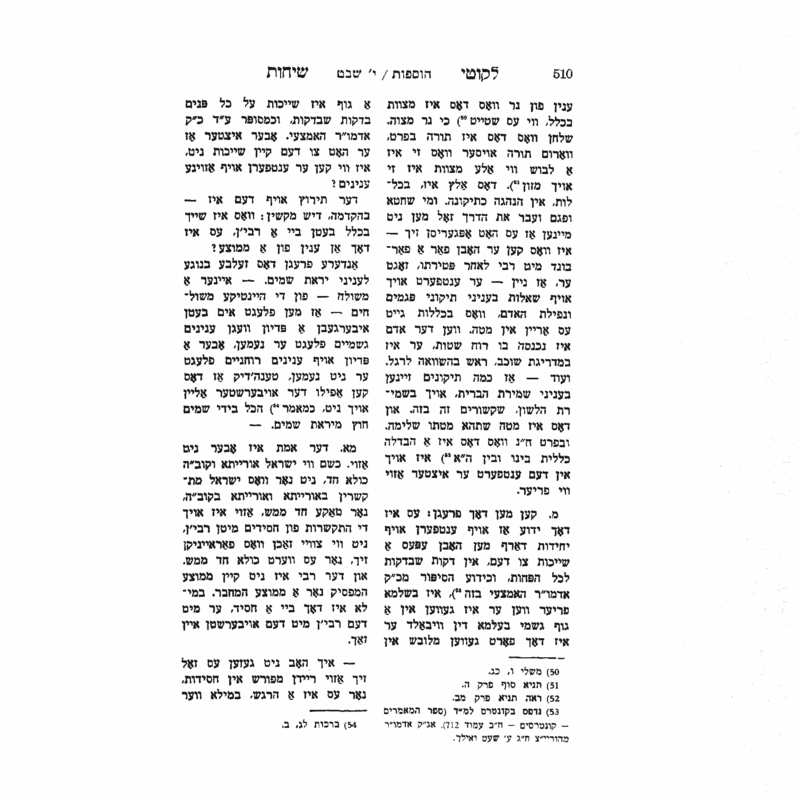 Hu hadovor asher dibarti – der Rebbe lent, der Rebbe gent, vehamefursomos einom tzrichos raayo. Those who deny do so because of hagoy asher bekorbicho, vos heist zich on misnaged, and no amount of proof will sway them. They deny at their own peril. So stop already! You are making a chillul Lubavitch! ( Btw why did each one have to find a makor in Torah finding that thier rebbes name fits with moshiach ?? Why did they care if it was their rebbe? RSo – Miscite is 100% a real word. Google it. Chossid: Please do. If you can speak to the shliach there to ask him to remove it, I’d appreciate it. When I spoke to him, he just thoughtI was another chabad-hating snag. A very good – but very biased and sarcastic – resource is על התורה ועל התמורה. Google it. A number of websites have scans. Wow! that’s the first smart thing TT has said so far! They refuse to hear you because of “Hagoy Bekirbecho” because of the Christianity within you! Exactly what many here have been saying all along! TT, I find comfort in knowing that if the Rebbe was around today he would surely put an end to your chillul. Chosid- you can’t answer every question and complaint with an accusation of being uneducated. Even after I mentioned more than once that I got my information from posters like you and from real life you still go back to that. It’s disrespectful to accuse everyone of being unlearned just because they don’t see things your way. I’m sorry you feel that way. Maybe you can get some help in understanding same as all the lubavitchers who left for other circles that got their answers. Like Warren Buffet used to say, don’t invest in an industry you don’t understand because it’s probably a scam. These scam companies use a bunch of fancy words and say “youre not educated enough to understand”. The thing is, the 13 ikkarim are rather simple and ironclad. If you violate them, you’re out. It’s on the people violating them to say why they’re not apikorsim. Syag doesn’t need my backup but blowing off serious shailas with “you’re uneducated” is not an intellectually satisfying answer. Please directly answer the question. The sicha Daas Yochid posted above DIRECTLY says you can ignore the 5th ikkar because the rebbe is G-d in a human body. That’s a direct violation of the ikkarim that says Hashem has no human form, Hashem alone runs the world, you can only daven to Hashem. There is an ikkar about how great Moshe Rabbeinu was, but nowhere in history do we find Jews saying “Moishe Rabbeinu vet helfn”. I’ll acceppt that most Lubavitchers dont’ accept that sicha kepshuto because it’s apikorsus, so we don’t have to view Crown Heights as an ir hanidachas, but there are clearly many who do based on the widespread popularity of der rebbe vet helfn. So yeah, stay away from current Lubavitch. True religion is for the uneducated as much as it is for the educated. Hashem didn’t create uneducated people for them to be secular. I know u’ll say “but our gedolim said its kfira” and it’s a mitzvah lfarsem or something similar to that. but that’s a lame excuse. as you say get better tactic. bring all mokoros where you see that its totally against pshat in this – not just “the ramchal or NH says” even if there is one safer that holds of it means that its not kfira even if majority dont agree with that sefer. Dont either answer abt hergesh that’s not either a question as I just wrote. Anyusername are you referring to mashgi lagoyim vaye’abdeim or ki yeshorim darchei Havayeh tzaddikim yelchu vom vechu’ yikoshlu bom? Either way, some nerve you have calling others uneducated when you just throw around musogim without knowing what you’re really talking about. The Rebbe ZT”L (edited) doesnt need or want an advocate like you. Shvaig shoin. AUO, you’re quoting your rebbe and saying you need to understand him while saying we can’t rely on our gedolim as a lame excuse. Which is it? You’re losing cheshbon and we’re 8 pages deep into this sugya so it’s time for a sikum. 1. should a non-chabad join chabad? 2. Should an existing chabadsker drop chabad? b. Many Lubavitchers take it at face value, as even you admit. They daven to the Rebbe and say things like the rebbe will help and the rebbe runs the world, clearly indicating the rebbe is the equivalent of Hashem. They say everything the Rebbe touched has Elokus, and the Rebbe can’t make a mistake even though even Moshe Rabbeinu made a mistake as explicitly stated in this week’s parsha. You just say that this isn’t chabad philosophy, and people make mistakes. But that means you’re saying moshiach caused people to worship avoda zara, even as you are metareitz dibburo to say he didn’t say what he said. Since avoda zara isn’t battul, then even one apikoires in Lubavitch means stay away, kol shekein when it looks like official Chabad philosophy. c. Many gedolim said that Chabad is avoda zara/apikorsus. You admit that too, but say the fact that they attack the Rebbe for saying kefira means they lose their status as gedolim. But everyone else holds of them. And they are confirming what is obvious to everyone who sees that sicha, that the rebbe turned his entire movement into direct avoda zara by claiming that a rebbe is on par with Hashem. So no need to say they made a mistake or got their facts wrong when we see they were correct. You agree with me that there are full-fledged ovdei avoda zara in Chabad based on understanding the sicha at face value, which rather explicitly says it’s ok to daven to the rebbe. You are just claiming he didn’t mean what he said, and it’s somehow coincidence that even normal chabadskers say things like “der rebbe vet helfn ” and The rebbe runs the world as if to imply that it’s the rebbe, not Hashem. In the gemara there is a concept of metareitz lediburo. If someone says apikorsus, then moridin velo maalin. Not my job to be metareitz diburo. It’s HIS job to correct the record. He had many years after publishing that to publish a retraction or correct the record. Shtika kehoda’ah. He said kefira and meant it. So the answer to question # 2. is yes, Chabadskers should abandon chabad. They don’t have to become misnagdim. They can join Lionzer or other Chabad non-Lubavitch breakaways that retain Chabad but dump the kefira/apikorsus. Please do so. Klal yisroel needs you. Be like Yisro- abandon the avoda zara to go tachas kanfei hashechina. We eagerly await you. You didn’t object when R’ Menashe Klein called them crazies. You could use that faulty logic to say to stay away from klal Yisroel. Daasyochid, klal yisroel has a chezkas kashrus and kol deparush meruba parush. Chabad is kavua. Plus the rebbe’s “rebbe = Hashem” atzmus sicha is a reyusa on every member of Chabad. Daasyochid, I will say that their usual excuse is “those aren’t the regular Lubavitchers, just the crazies”. They don’t use the term apikorsim because they refuse to acknowledge the elephant in the room. But for us, we are trying to be mekareiv them, let’s use the appropriate term. I can’t speak for Rav Menashe Klein zt”l. But I accept his pask as someone who knows the bounds of appropriate and inappropriate chassidus. I think my sikum was overly complex so let’s boil it down. 1. Should you join chabad? No, because the movement has many apikorsim based on the rebbe’s own sicha equating rebbes with Hashem, as posted above. Gedolim agree so don’t let yourself get taken in by sophistry from Chabdskers. 2. Should a chabad person leave chabad? Yes, as above. Gedolim agree so don’t let yourself get taken in by sophistry from your mashpiim. Are you gonna say Moshe/moshiach was a kofer C”v or that hashem should have never given us the torah c”v?? I disagree with the way you understood about what I said about gedolim – yes accourding to their opinion it’s a wrong way of learning but thier are those that disagree and say its correct…. No one ever said that davening TO the rebbe is ok.
And no, at face value the rebbe Cleary bring sources to what He says. And No, I’m not needed to farentfer the rebbes sichas. No one is trying to convince you to agree with chabad you were the one that asked the question. Mods nice for checking to zatzal. Can you also change next time someone says the Rebbe is “dead” to the Rebbe “past away”?. I don’t know exactly what you want I should answer, and where is the question. All I see is bunch of idiotic statements. Anytime I say to check something up, no one wants to bother checking, (at least thets what I see from vast majority of you) and just relie on what people say and what it says online. I don’t think it’s right to state a facts , before checking up exactly what the concepts mean. What would you tell someone challenges you and claims that “it says in Torah בראשית ברא אלוקים that bereishis created Hashem (Cs”v) and says you guys are koifrim because it says in the Torah that breishis created, it’s black and white kifira? And if Torah didn’t really mean that, then Torah shouldn’t have said it in the first place”? Obviously you would tell them to check up Rashi, and meforshim. Same is with Chabad yes in the first place it’s sounds radical, but of you only do some REAL research of the concepts and ask the well respect rabbonim in Lubavitche you would have the sugyia clear. Like all the Gedolim and Rebbeim that still visited the Rebbe even after his statement. (I doubt you are going to call all of them ovidei avoda zorah.) They came because they knew what the Rebbe meant and it wasn’t kifira at all. If you have brains and use them if not go seek help. In defense of the Rebbe zatzal, it’s quite clear that he never intended kefira ch”v , and great gedolim still visited him after the sicha. Most chabadnks don’t understand the sicha in a radical way, and the rebbe clearly says in the sicha, if you understand it in a way thats apikursus, then its better you dont learn it! So Lamir Lernin Torah, you’re being intellectually dishonest by calling it kefira, by saying the rebbe meant kefira ch”v! BTW, there’s similar language in Kedushas Levi and Likutei Mohoran, where they’re held of by everybody! LLT, most people had much bigger problems with sukka (discussed in a previous thread) and meshichists (also discussed). Atzmus is almost never understood in a kefiradike way by true lubaviche chassidim, as the rebbe explicitly instructed. BTW, its bothering me that YWN CR is becoming the bash chabad site. 90% of all chabadnikim are good shomrei torah umitzvois. In regards to if someone should join chabad, if it helps him get closer to Hashem – bemakom shelibo chafetz – he should definitely join. I actually said exactly that earlier on this thread. That is assuming it got past moderation. This thread moved so fast I didn’t actually see. Point is, don’t worry, I’m no hypocrite. I give the same treatment to the MO. What you’re saying is not how any poskens. Just because we’ve formed groups on earth doesn’t mean Hashem compartmentalized the Jewish people. Even though rov Lubavitchers believe in kefira, they still have the same chazakah as the rest of us. Unless a Lubavitcher specifically publicizes his meshichism, his wine and aidus is kosher. Haven’t you noticed the references on this thread to gedolim eating at Chabad events? You think they aren’t aware of what most Lubavitchers believe? Yeshivishrockstar, The Rebbe isn’t the Torah. He said what he said, had 12 years to correct the record, never did. His sicha EXPLICITLY says it’s ok to daven to a rebbe directly because of atzmus. This isn’t a snag diyuk. It’s befeirush in the atzmus sicha. Like that was his whole point. Please show me where the likutei moharan or kedushas levi violated the 13 ikkarim and said it’s ok to daven to a person. People have a bigger problem with sukkah and meshichism because they are not familiar with the atzmus sicha. Rav Shach zt”l was fully aware of the apikorsus and called them out on it. Meshichism follows from this- if the Rebbe can’t make a mistake because he’s part of Hashem then he couldn’t have been wrong about him being moshiach. Well I don’t know who your friend is, but he definitely got to see a doctor. This is not what the Rebbe holds or the people that the Rebbe put in charge of his moisdois. I got some friends that are tzoikim, should I now smear the whole Judaism that they don’t believe in Torah sheh Bal peah? I got a friend, his name is Bernie Madoff, should I go smear all jews as scammers? I got a litvak in my shul that did a terrible sin (which I won’t mention) should I now say all litvaks commit it too? Chossid, in this case, the person above was basing himself on the atzmus sicha which the Rebbe stated. The Rebbe explicitly blurred he line between human and Hashem. It’s like whe Christians call Yoshke both human and god, based on their theology. The Rebbe explicitly adopted this. He owns this. Do you think that your blatant lie will become true if you repeat it sufficiently? The Rebbe doesn’t use the word “daven”, and isn’t discussing davening to a Rebbe – something Chassidim have never done – the Rebbe is talking about “betten” in English, “asking, demanding, beseeching”, something Chassidim have done throughout the generations, and across the Chassidish spectrum, it’s not exclusive to Lubavitch. 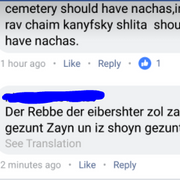 In Yiddish we say about someone who has passed on, “Er zol Zayn ah gutte better” do you know the translation of those words? We ask our Rebbeim to beseech the Eibeshter on our behalf. Which raises the question, how is that ok? Why do we need a Memutzah? Is that not a problem? 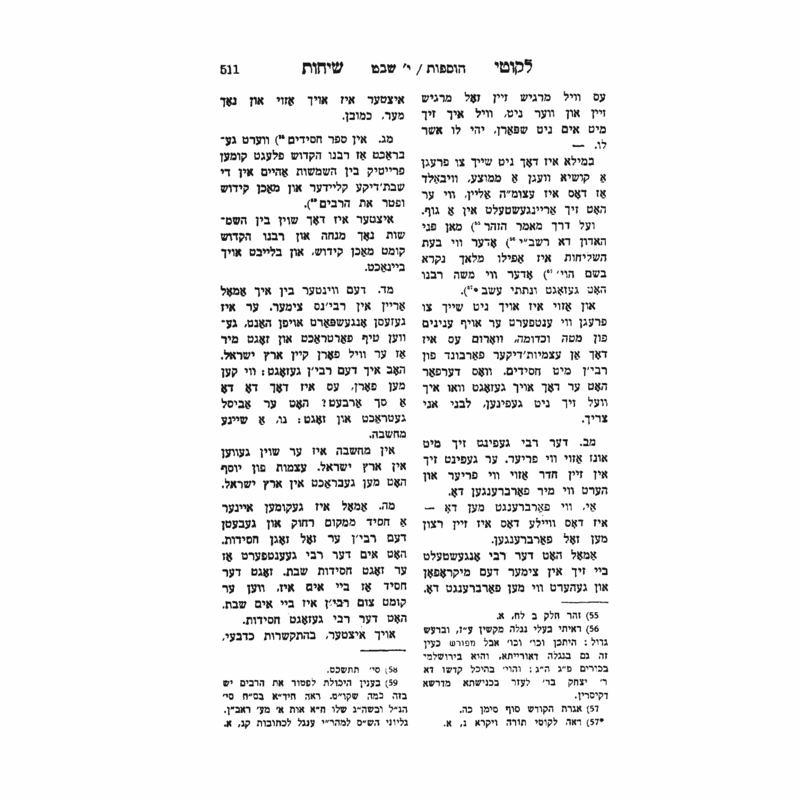 Because Moshe gave a very vague description about when he is coming back the yidden got confused and made an eigel…. I know it sounds very weird and very extreme but its the same thing. Nice try, but the “Er zol Zayn ah gutte better” means the neshomo is beseaching Hashem, not that we’re beseaching a neshomo, ch”v. If all the Rebbe was addressing is how you can ask a Rebbe to daven to Hashem, well, nobody really questions that (you can ask anyone to daven to Hashem for you), and the whole atzmus umahus areingeshtelt in a guf bit is unnecessary. Where does a person develop such a deeply rooted animosity toward a Tzaddik, and an entire Tzibbur of Yereim U’shleimim?? Don’t blame “the gedolim” for your hate, most of the Gedolim have a wonderful relationship with Chabad, and are true examples of Ohavei Yisrael. Not so with you and your ilk however, you are actively seeking reasons to hate Yidden, purely out of Sinas Chinam. .בברכת יתמו חטאים מן הארץ, חטאים ולא חוטאים. This reply was modified 2 weeks, 5 days ago by YW Moderator-💯. You have no legitimate answers = we’re all haters. Got it. Someone is critical of Chabad = he’s not a godol, ergo, no gedolim are against Chabad. Got it. “Nice try, but the “Er zol Zayn ah gutte better” means the neshomo is beseaching Hashem, not that we’re beseaching a neshomo, ch”v. 1. I was helping translate the word for the benefit of those unfamiliar with Yiddish, and giving it context. The different variations of those Taanos have been around since the dawn of Chassidus, some more elequently expressed, many less so. This is what the Rebbe is answering. But you pulled a nice switcheroo there when you changed the subject of the “betten”. You claimed it doesn’t mean the same as davening, but when you ask, beseach, demand of a human being something which is in Hashem’s realm, it’s problematic. This is what the Rebbe is answering. The answer doesn’t fit the question you claim he’s asking. There’s a very simple answer to the question why you ask someone to daven on your behalf – perhaps that person has zechuyos you don’t, so his tefilos will be answered. It doesn’t replace your own tefilos, it’s in addition to your own tefilos. Atzmus umahus areingeshtelt in a guf doesn’t enter the equation unless the question was about beseaching, asking, demanding, i.e. davening to the person. Btw do you know the history of the rambam – yes he was called a kofer, ppl burned his seforim, and made up alot of things about him………..
Look what happened a couple of years later he is considered a majer halachic authority…. In those days if you called someone that went against the rambam, a hater he would say the same thing that @dy says. Yes, all the gedolim were against the rambam…. There are many concepts in chabad that the gedolim used to say is totally wrong and the gedolim condemned it but slowy ppl are realizing that those concepts are not wrong. Anyusername: “Btw why did each one have to find a makor in Torah finding that thier rebbes name fits with moshiach ?? Where does anyone say that they cared that it was their rebbe?! This is like the tenth instance when you want a source to say something so you decide that it does, and then you prove something from it! NOWHERE does it say that they were referring to their rebbe himself. The Abarbanel clearly says that they were referring to attributes. And I am sick of researching YOUR resources for you and then being told that you didn’t mean that. Instead of quoting me an Artscroll source, YOU post the exact wording of the Abarbanel and tell us what you are proving from it. Just for the record, you will not find any post of mine saying that Moshiach can’t be from someone who has died. You WILL find me saying that if you are just going to base yourself on Sanhedrin 98b then you it is warped and (at least close to) apikorsus to say that since the Gemoro says it’s Doniel I can say its the lubavicher rebbe. You will also find me saying that there is absolutely no chance – and you may also possibly find me saying that there never was any chance – that the lubavicher rebbe is/was Moshiach. I reiterate that in light of the sicha that was posted where your rebbe says that “based on a hergesh” you can daven to a human. But I have to give it to you. You are a true lubavicher (oxymoron?) because when a claim you made is shot down in flames you just ignore it and say you claimed something else. You specifically claimed that the Sdei Chemed says that a talmid is SUPPOSED to think his rebbe is Moshiach. I looked it up and said that he DOES NOT say that. You have conveniently ignored that. So there’s one thing I have to agree with TomimTihyeh: I have your number!